To bar mitzvah or not to bar mitzvah, that is the question. Need some help? Want to learn ways to make your child’s special day inclusive for the whole family? Find out how other families have handled these issues in InterfaithFamily.com’s selection of articles, resources and links. Our booklet, Bar & Bat Mitzvahs For The Interfaith Family, explains the wonderful milestone marking adulthood, the bar mitzvah (for a boy) or bat mitzvah (for a girl), a life cycle event taking place at the age of 13. Planning a bar or bat mitzvah can be tricky. 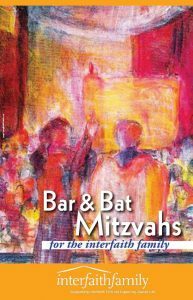 Bar/Bat Mitzvah Ideas and Primer for Interfaith Families includes detailed information about what takes place at a bar mitzvah or bat mitzvah as well as information on ways a child’s interfaith family can participate in the celebrations, and possible limitations on participation in some synagogues. Watch this video to see what to expect at a synagogue. ClassesInterfaithFamily offers classes and workshops for interfaith families starting to think about, or in the early stages of, planning a bar or bat mitzvah. Is Preparing for a Bar or Bat Mitzvah in Your Interfaith Family for you? From the Jewish Women’s Archive, MyBatMitzvahStory.org provides a safe and fun setting in which girls can explore and express their emerging identities as Jewish women. MyJewishLearning.com’s Adopted Children, Conversion, and the Bar/Bat Mitzvah or Bar/Bat Mitzvah Planning Guide.